Sweden went to the polls Sunday in a general election that is expected to be one of the most unpredictable and thrilling races in the Scandinavian country for decades amid heated debate on immigration. Sunday's election will be Sweden's first since the government in 2015 allowed 163,000 migrants into the country of 10 million. While far less than what Germany took in that year, it was the most per capita of any European nation. About 7.5 million registered voters will choose from almost 6,300 candidates for a four-year term in the 349-seat Riksdag, or parliament. It's highly unlikely that any single party will get a majority, or 175 seats. The latest opinion poll conducted by pollster Novus for public broadcaster SVT suggested Friday that Prime Minister Stefan Lofven's ruling Social Democrats would substantially lose seats but still emerge a winner with an estimated 24.9 per cent of the votes. The poll suggested the far-right, anti-immigration Sweden Democrats — led by Jimmie Akesson — would get 19.1 per cent of the votes in what would be a major increase from the 13 per cent it captured in the 2014 election. The centre-right Moderates party is set to take to take third place with 17.7 per cent. During a heated debate Friday evening of party leaders, Akesson caused a stir by blaming migrants for the difficulties they often have in finding employment. At the party's rally on Saturday, he strongly criticized Lofven's government for "prioritizing" the cause of asylum-seekers. "This government we have had now . 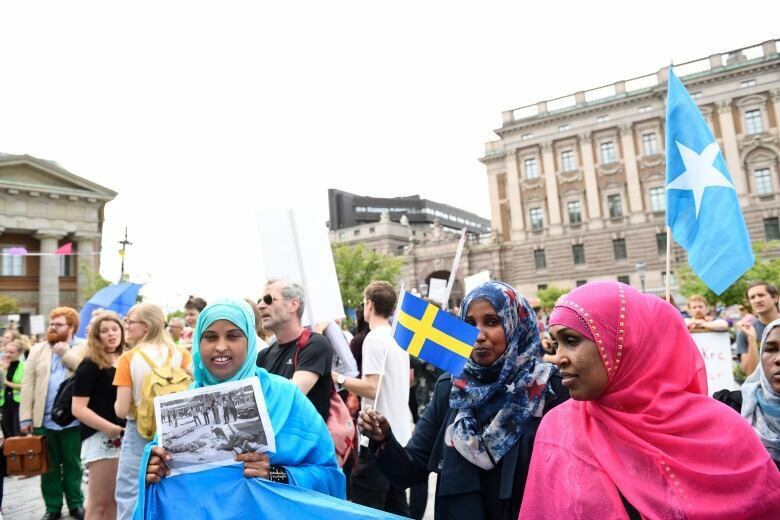 they have prioritised, during these four years, asylum-seekers," Akesson said, giving an exhaustive list of things he says the government has failed to do for Swedish society because of migrants. "Sweden needs breathing space, we need tight responsible immigration policies." Mohamed Nuur, a Social Democrat candidate of Somali descent told The Associated Press that he sees Akesson taking Sweden back to the past. "For me, the Sweden that he (Jimmie Akesson) wants to see … that is not our future," Nuur said. "That is to go back in history. For me, when he is saying that immigrants are not welcome to Sweden …he is trying to spread hate between the people. Actually, it's the immigrants who built up this country. "